Delivery bikes are a fact of life in Korea - and not just on the streets - apparently being the owner of such a vehicle entitles you to ride on the pavements/sidewalks at speed weaving your way in and out of pedestrians, which by some miracle, you usually manage to miss. Although not quite always, as I finally found out a couple of weeks ago when a wing mirror connected solidly with my arm. But in all my time here I was never aware that McDonald's had got into the local delivery business, so perhaps this was a new development while I was away. The bike even has "McDelivery" written on its side, in case there was any doubt. Personally I don't quite picture myself perusing their menu to pick out a cheap burger and fries, but to be fair, it's no different from the kind of food local Korean outlets would happily bring to the door, usually at much lower prices, and quite possibly, profit margins. A couple of days after taking this shot, another McDelivery bike shot by me at around 20mph as I walked down the street, missing me by a finely calculated couple of inches and doing nothing for their corporate image with me. Branding your delivery vehicles here can be a double-edged sword. Motorcycles on sidewalks are one reason I usually have something handy to throw. 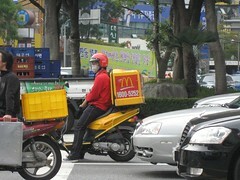 McDonalds delivering (and KFC, BK, etc etc) is yet another reason that Asia is better than the UK. I eat fast food when I feel lazy. If I'm lazy then I don't want to have to drive (or worse - walk) to McD's to get something. I want a spotty youth on an underpowered motorbike to deliver it (tepid) to my front door and charge me for the privilege. I loved Singapore with its "no minimum delivery" policy. You could order a 50c cone, delivery charge 50c. Just for the hell of it. At 4am.